Competing with the likes of Detroit and Ann Arbor, Jackson won the battle to build Michigan's first state prison in 1838. During the era of the "Big House" and industrial growth, the penitentiary's on-site factories and cheap inmate labor helped Jackson become a thriving manufacturing city. In contrast to Jacktown's beautiful Greco-Roman exterior, medieval punishments, a strict code of silence, no heat, no electricity and a lack of plumbing defined life on the inside. 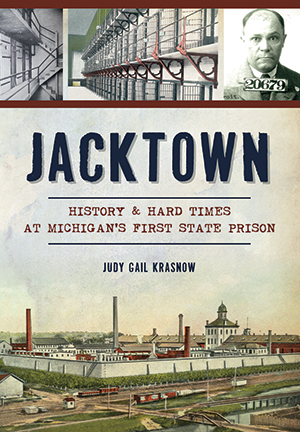 Author Judy Gail Krasnow shares the incredible stories of life at Jacktown, replete with sadistic wardens, crafty escapees, Prohibition's Purple Gang, a chaplain who ran a brothel and influential reformers. Judy Gail Krasnow is the founder and director of Jackson Historic Prison Tours, leading tour groups through the history and tales of Jackson's state prison. She lives in Armory Arts Village, a resident artists' community converted from Michigan's first state prison. Judy is the author of a memoir about her father, Hecky Krasnow: Rudolph, Frosty, and Captain Kangaroo. She is a Chautauqua scholar and performance artist with various humanities councils and presents historical storytelling programs and portrayals about women who have left their marks on history.